As for the strip- we finally get to see Mordred’s father. Well, part of him. He spoils his grandson. Fun stuff the Garrott family. Fun stuff. And go see Wall.E – It’s not even fair how good that movie was. *sniffle* So beautiful! Happy 4th of July! I love seeing Security with that black eye; it looks really painful. 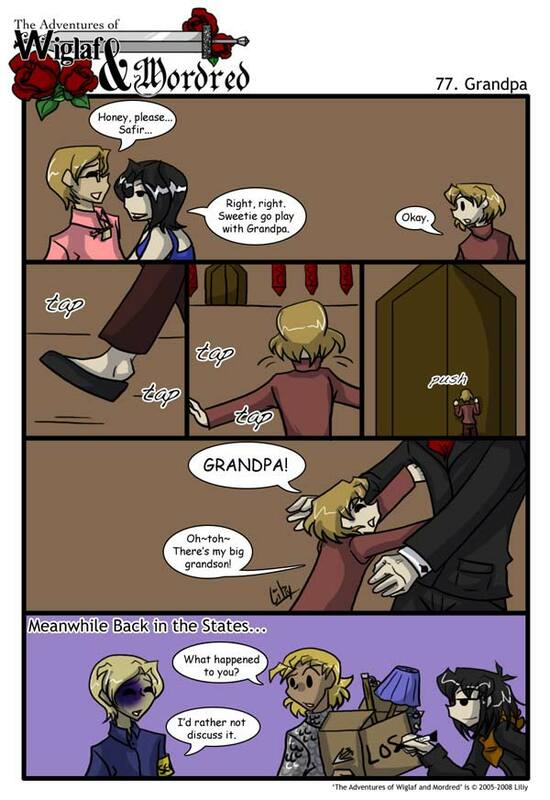 XD And what exactly is that box of stuff Wiglaf and Mordred have? Wiglaf is moving into Mordred’s pad. :D Clearly Mordred isn’t being very helpful. Safir looks real cute when he’s happy to see his grandpa. Very touching. So he teleports? I mean, he got punched 5 seconds previously in BRITAN. Poor security, got beat up. (=0.o=) i didn’t know Wiglaf owned a flail…awesome!